Your stereo speakers under the seats, did you have to cut a hole to mount them? Can you access the rear of the speakers from the lazarette? A couple of weeks ago you posted to the Rhodes list about replacing the fixed ports with opening ones. At the moment, my attention is on installing stereo speakers along the cabin wall and I'm wondering how much depth you found between the inner and outer walls of the cabin top. The speakers I'm thinking about require a depth of 1". While you had the port out, could you tell if there was enough open space to run wires fore and aft through the cabin wall? I found that there was less than 3/4" of depth between the inner and outer cabin walls with the lower portion of the opening a bit deeper than the upper portion. I had to make several passes on my jointer/ planer with the treated 3/4" thick wood blocks I cut for supporting the new hatches on both the upper and lower portion of the openings. I don't know what types of speakers you plan to install but I can't recall seeing speakers with the cone and magnet this shallow. If it works for you please let me know as I've been thinking of installing a stereo system in our boat. I have a hard time going for any length of time without listening to music, especially Stevie Ray or Carlos Santana (See Milagro). The photo web site has pictures that show Rhodes 22 stereo installations. The 1st two photos show my stereo installation down in the galley. The 3rd picture shows my cockpit speakers mounted on the transom. I used 16 gage shielded twisted pairs for my speaker wires in order to absolutely eliminate any possibility of interference to the compass &/or any other electronics on board as well as prevent any problems with 60 cycle hum &/or ignition noise in the sound system. Stereo systems can be both the cause & the recipient of interference! The use of shielded twisted pairs for my speaker wires did not introduce sufficient capacitance into my system to cause a problem. The sound from my stereo system is absolutely clean of any spurious signals & I don't get any interference in any of my other on-board electronics despite running the speaker wires all over the boat. However, you should check the specs for your system before you use shielded twisted pairs for your speaker wires. NOTE: I did not 1st try installing the speakers with plain wire as some of the others have done. You may be able to get away with it or then again, you may have a problem. I used shielded twisted pairs for my speaker wires as a simple matter of good anti EMI practice. Life is too short to constantly have to troubleshoot & redo systems. 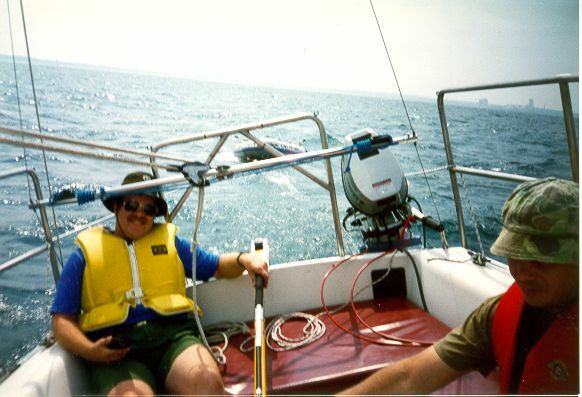 I'd rather be out sailing & listening to the stereo on my boat. The main reason for keeping maximum separation between the ship's compass & the speakers is the powerful magnets in the speakers. Try for at least 6 feet of separation between the speakers & the compass & more is better. Where is your ship's compass mounted? Remember, you don't want the speaker magnets anywhere near the compass. On Dynamic Equilibrium, we have the cockpit speakers mounted in each corner of the transom facing forward. 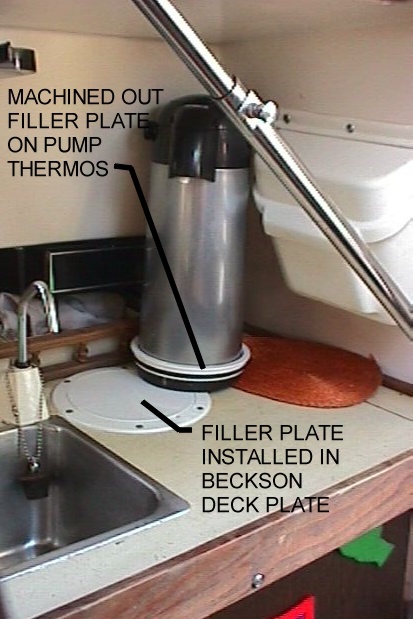 The cabin speakers are mounted at the aft end of the V-berth facing port & starboard. These locations have worked well for 13+ seasons & counting. 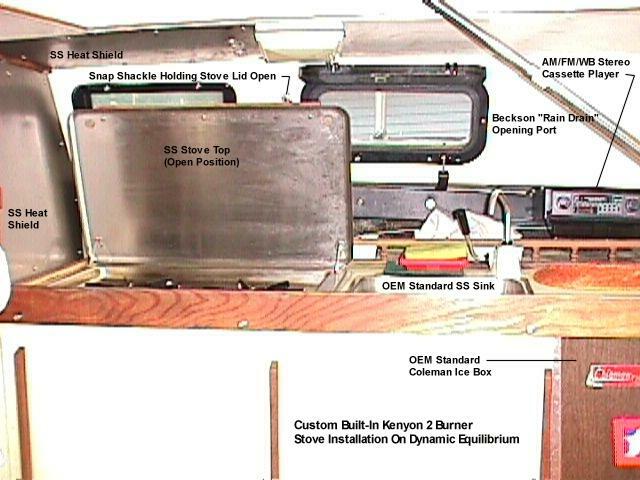 As far as the stereo unit itself, there is a picture of Dynamic Equilibriums galley on the photo web site which illustrates the installation up above the galley counter top.